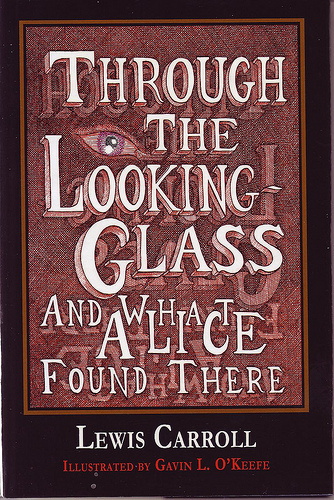 Through the Looking Glass and What Alice Found There by Lewis Carroll, illustrated by Gavin L. O’Keefe. Gavin O’Keefe is an Australian illustrator. The pictures are suitably surrealistic black and white drawings, and don’t suffer from the usual problem of just being tooooo influenced by Tenniel. Originally published in 1872, Lewis Carroll’s ‘Through The Looking-Glass And What Alice Found There’ takes us on a very different journey to Alice’s previous excursion into Wonderland. In ‘Looking-Glass,’ Alice passes through the mirror into a world of chess-people, curious school-boys, a living egg, sentient and loquacious flowers, and a host of other strange and fantastic creatures. Alice is immediately given an evolving role in a game of chess being played out across the whole of the Looking-Glass world. As she travels through a landscape which at times defies the ‘normal’ laws of nature, she encounters characters who challenge her experience and perception. This world of ‘nonsense’ ultimately offers Alice, and the reader, insights into the ‘normal’ world.